Anil Kumble v/s Australia at Sydney, 2003-04: The lanky leg-spinner began his awe-inspiring performances in this calendar year with a magnificent display of eight for 141 in the last Test of the series. 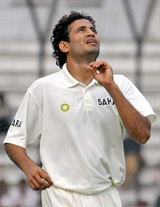 It will be an interesting to take a look at the best bowling performances by Indian bowlers on foreign soil in the wake of Irfan Pathan's magnificent eleven-wicket haul against Bangladesh at Dhaka. * Vinoo Mankad v/s England at Lord's, 1952: With the bat, Mankad scored 72 and 184, then the highest individual score by an Indian in Test cricket. With the ball, his figures in England's first innings were outstanding - 73 overs, 24 maidens, 196 runs and five wickets. Although India lost the game by eight wickets, the match was immortalized as 'Mankad's Match'. * Bhagwat Chandrasekhar v/s England at the Oval, 1971: The home team had snatched a vital first innings lead of 71. However , Chandrasekhar, the withered-arm wonder, completely mesmerized the Englishmen with 6-38 in the second essay to bowl out the hosts for a meagre 101. India then romped home by four wickets to post their first ever win in 22 tests in England. * Kapil Dev v/s Australia at Melbourne, 1980-81: A courageous display by all-rounder Kapil Dev despite a pulled thigh muscle took India to its third victory in 17 Tests in Australia and a shared rubber there for the first time in four visits. Chasing a target of 143, the home team collapsed for 83. 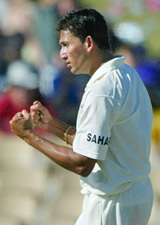 * Ajit Agarkar v/s Australia at Adelaide, 2003-04: The medium-pacer from Mumbai provided a sterling display in the second innings with figures of six for 41 off just 16.2 overs . It initiated an Australian collapse, and the hosts were bowled out for 196. India clinched the issue with four wickets in hand to take a one - nil lead in the series . * Anil Kumble v/s Australia at Sydney, 2003-04: The lanky leg-spinner began his awe-inspiring performances in this calendar year with a magnificent display of eight for 141 in the last Test of the series.